← ASK FATHER: Is a priest allowed to do the readings, or must a lay person do them? In the pre-Conciliar Missale Romanum this Sunday’s Collect prayer in the Extraordinary Form of the Roman Rite was in the ancient Veronese Sacramentary in the month of September, a fast time. It was a bit different: Absolue, domine, quaesumus, tuorum delicta populorum, et quod mortalitatis contrahit fragilitate purifica; ut cuncta pericula mentis et corporis te propellente declinans, tua consolatione subsistat, tua graita promissae redemptionis perficiatur hereditas. It also was used on a weekday of Lent. It also survived to live on in the Novus Ordo book, as well. Absolve, quaesumus, Domine, tuorum delicta populorum, ut a peccatorum nexibus, quae pro nostra fragilitate contraximus, tua benignitate liberemur. A nexus, from necto (“to bind, tie, fasten; to join, bind, or fasten together, connect”), is “a tying or binding together, a fastening, joining, an interlacing, entwining, clasping” and thence, “a personal obligation, an addiction or voluntary assignment of the person for debt, slavery for debt”. Nexus is used to indicate also “a legal obligation of any kind”. It is not uncommon to find somehwere near nexus the word absolvo, which is “to loosen from, to make loose, set free, detach, untie”. In juridical language it means “to absolve from a charge, to acquit, declare innocent”. Here is a truly fascinating piece from the mighty Lewis & Short Dictionary: “to bring a work to a close, to complete, finish (without denoting intrinsic excellence, like perficere; the fig. is prob. derived from detaching a finished web from the loom”. Contraho in this context is “to bring about, carry into effect, accomplish, execute, get, contract, occasion, cause, produce, make”. Blaise/Dumas indicates that contraho means “to commit sin”. Unloose, O Lord, we implore, the transgressions of Your peoples, so that in Your kindness we may be freed from the bonds of the sins which we committed on account of our weakness. When you see an English version that is shorter than the Latin original, your alarms bells should ring. 18 words in Latin, 14 English words in the obsolete ICELese. Think of sin as a web which we both weave and then get caught in. As Hamlet says the engineer is “hoist with his own petard”. When our First Parents comitted the Original Sin, they contracted (contraho) the guilt and effects for the whole human race. At that point our race was bound by justice. To be “justified” again, and to be unbound from our guilt and set to right with God, reparation had to be made. Thus, the New Adam allowed Himself to be bound by His tormentors, and be bound to the Cross, and then unbind His soul from His Body and die. The Sacrifice of the Lord was aimed not just at a few chosen or privileged people. It was for all peoples. The Sacrifice was “for all”, though “all” will not accept its effects. Some will refuse what Christ did to free us from our sins and the punishments of eternal hell they deserve. “Many” will be saved as a result of Christ’s Passion and Death. Which side of the reckoning will you be on. Our days are indeed like a shuttle. 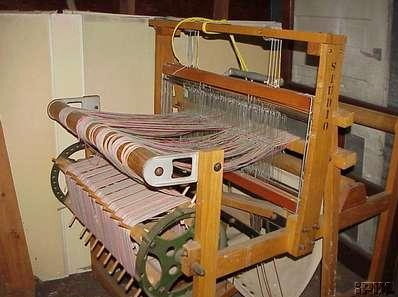 Some years ago I met a women who wove cloth with a large loom. She showed me how it worked. In her practiced hands, the shuttle lashed swiftly back and forth, back and forth, back and forth, while the loom packed the threads together. The cloth “grew” as it was woven, slowly, but surely. The shuttle snapped back and forth with increasing speed as she found her rhythm and settled into it. At the end… SNIP… the thread was cut. Absolutely. This entry was posted in GO TO CONFESSION, Liturgy Science Theatre 3000, WDTPRS and tagged absolvo, loom, shuttle, web. Bookmark the permalink.